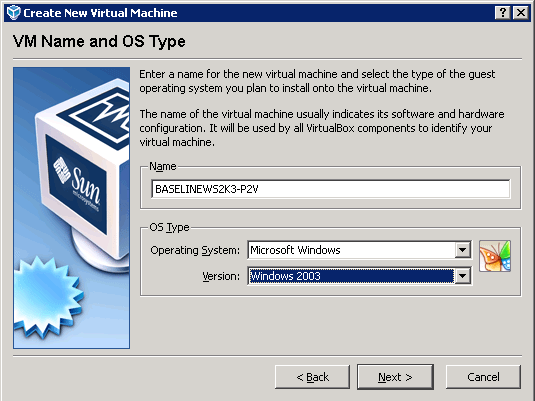 Sun VirtualBox physical-to-virtual conversions can be daunting because the offering lacks native support for a P2V conversion. But fear not; VirtualBox P2V is possible. Part one of this series focuses on how to prepare a VMware virtual machine (VM) for a VirtualBox conversion. Part two will cover driver installation, management and other postconversion issues. Conversion technologies are a great way to start the server consolidation process. Sun VirtualBox, however, lacks many of the options for converting physical servers. Also complicating matters is that VirtualBox does not natively support a P2V conversion tool. Even the cross-hypervisor P2V conversion tools -- such as PlateSpin Migrate, and my underdog favorite Vizioncore Inc.'s vConverter -- do not support VirtualBox as a destination hypervisor. Strangely, while hypervisors typically produce a conversion tool, VirtualBox has not. Despite these obstacles, fear not -- there is a way. Last year, I blogged about importing VMDK into VirtualBox -- a key part of converting physical servers to VirtualBox VMs. The process also requires VMware vCenter Converter, but there are a few steps involved. Here I will cover a typical P2V conversion scenario involving a Windows Server 2003 system. First, install vCenter Converter (standalone or local edition) on a Windows system. This can even be installed on the Windows Server 2003 system you're converting. Usually, I designate one system as a "launchpad" for conversions. Once installed, launch the convert virtual machine task. The next screen will ask what server you want converted. For this article, the server I am converting is named Baselinews2k3. For VirtualBox to use the converted system, it needs direct access to the VMDK files. The easiest way is by selecting a non-ESX or ESXi virtualization format. In this example, I use the VMware Workstation format. vCenter Converter then permits some additional conversion options -- most important, the disk options. Here the choices are resizing the destination disk geometry, selecting a fully allocated (thick or fully provisioned) disk, or choosing a thin-provisioned, or not preallocated, disk format . The wizard will quickly finish and then launch the conversion task, which may take time. Once the conversion is complete, the VMDK files are used to create the VirtualBox VM. 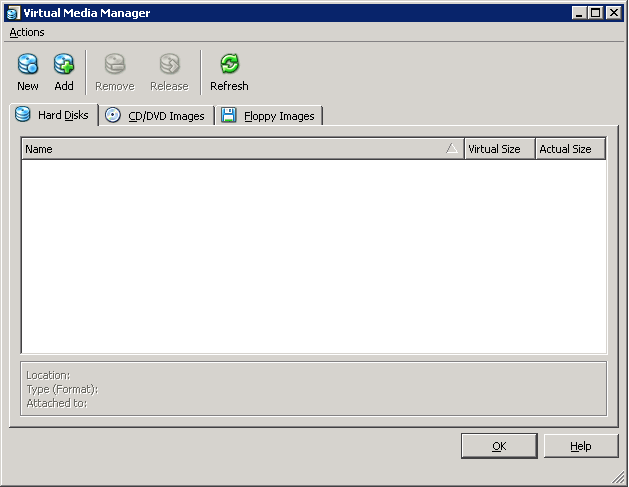 In this example, I use VirtualBox 3.0.10 on a Windows Server 2003 host to run the VirtualBox VMs. In general, Virtual Media Manager is the key to managing disk access in this situation. Once Virtual Media Manager has access to the disk files, create a VirtualBox virtual machine with these newly converted drives. 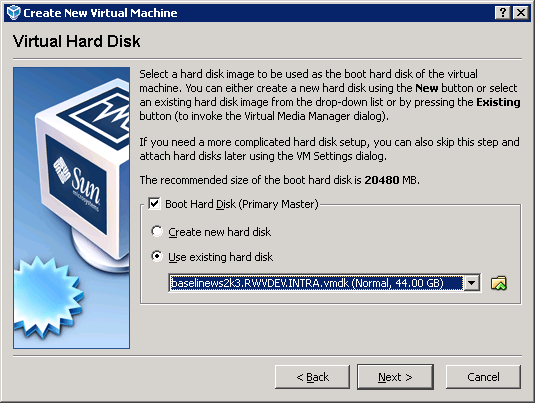 During the provisioning process, you can select the virtual disk files assigned to the VM. 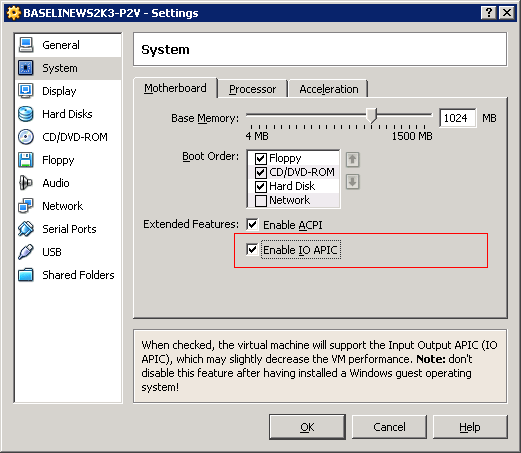 The final step is to enable VirtualBox's I/O Advanced Programmable Interrupt Controller feature. The VirtualBox VM is now ready to boot up. You may have to architect a storage solution to meet your needs. Operating system storage drivers and devices are your best bet to get a workable storage system in place. VirtualBox does not offer a clustered file system, such as VMware's Virtual Machine File System or Microsoft's Clustered Shared Volumes. Some advanced options with Sun storage may be available for VirtualBox, such as Sun Storage 7000 Unified Storage Systems. Learn about Guest Additions, shared folders and more in this Sun VirtualBox guide. Rick Vanover (vanover-rick@usa.net), VCP, MCITP, MCTS, MCSA, is an IT infrastructure manager at Alliance Data in Columbus, Ohio. He is an IT veteran specializing in virtualization, server hardware, operating system support and technology management.